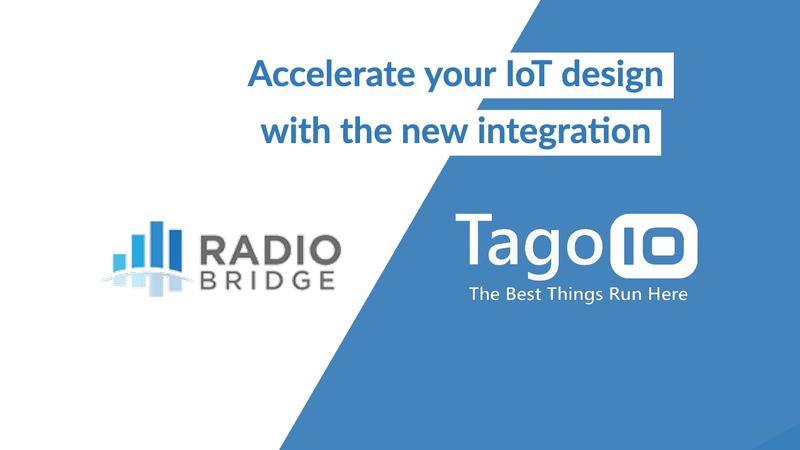 Radio Bridge & TagoIO - Combining the best hardware and software platforms to speed up the deployment of IoT applications. Minneapolis, MN - Raleigh, NC Jan 14th, 2019. TagoIO and Radio Bridge are pleased to announce the partnership that will reduce the time-to-market deployment of the Sigfox and LoRaWAN RadioBridge devices when combining with TagoIO’s IoT Cloud platform capabilities. Both companies identified new opportunities to help developers and businesses that need to bring new solutions to the marketplace with lower cost, lower risks and higher agility. By combining the versatility of the TagoIO platform with the impressive variety of RadioBridge devices, customers will build more competitive solutions for smart buildings, smart cities, services, industrial automations, hospitality businesses, and any other industry that needs to be transformed. “Radio Bridge is excited to offer such a high level of integration with an industry leading platform such as TagoIO. TagoIO’s analytics and user experience are a great addition to the Radio Bridge Device Management Console which acts as a middleware platform between TagoIO and the LPWAN network. End users can now be up and running with a sensor to cloud solution within minutes.” says Radio Bridge CEO Steve Kilts. “We are very proud to announce the integration of TagoIO’s platform with Radio Bridge devices. This initiative will not only result in improvements applied during the prototyping phase, but it will also provide the highest level of flexibility and reliability for our customers to scale up their IoT solutions,” commented TagoIO’s CEO, Fabio Rosa. By using this new integration, developers can easily forward data from their devices to TagoIO and process them in realtime. As the applications grow, developers can easily manage devices, users, dashboards, and analytics by using our management tool to keep the full control of ownership. As the first result from this partnership, both teams worked together and released more than 24 Radio Bridge device connectors that are now available on the TagoIO platform. Users can easily add their device following the same process for Sigfox or LoRaWAN devices. Developers can follow the new tutorial and start building their applications for free from here.